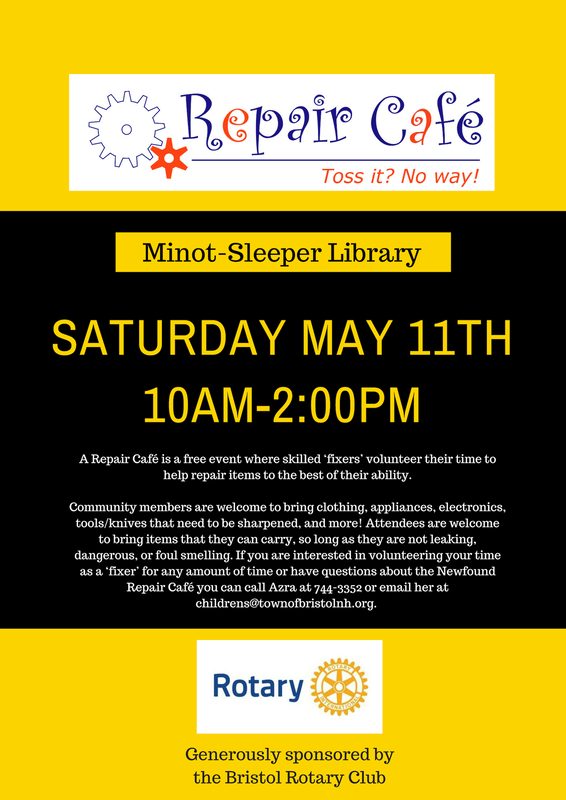 The Minot-Sleeper Library will be the first library in New Hampshire to host a repair cafe! This FREE event is supported by our local Bristol Rotary Club. A Repair Café is a free event where skilled ‘fixers’ volunteer their time to help repair items to the best of their ability. Community members are welcome to bring clothing, appliances, electronics, tools/knives that need to be sharpened, and more! Attendees are welcome to bring items that they can carry, so long as they are not leaking, dangerous, or foul smelling. Those wishing to bring multiple items may do so, but will be asked to re-enter the line for each additional item. Some replacement parts will be available and people whose items cannot be repaired, will be given names of related local repair places. The Newfound Repair Café is an opportunity for items to be fixed, instead of ending up in the landfill. In addition, it is a chance for community members to socialize and perhaps learn how to fix their own items in the future! If you are interested in volunteering your time as a ‘fixer’ for any amount of time or have questions about the Newfound Repair Café you can call Azra at 744-3352 or email her at childrens@townofbristolnh.org. This event is free to all and generously sponsored by the Bristol Rotary Club. For more questions about Rotary Club please email President Bill Karkheck Bill.karkheck@deadriver.co. If you would like more information about the Repair Cafe Click Here. If you want to know more about the Bristol Rotary Club Click Here.